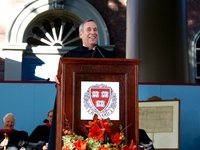 Lawrence S. Bacow was sworn in as Harvard's 29th president Friday in a ceremony attended by four University presidents. 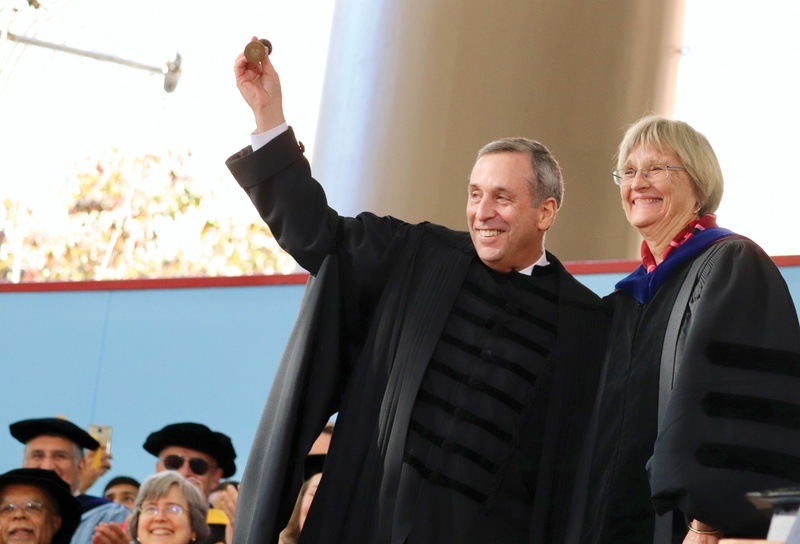 Following a months-long search process filled with secretive meetings and surprising twists, the Harvard Corporation selected Lawrence S. Bacow to be the University’s 29th President in February. The nine-month search kicked off after former University President Drew G. Faust announced in June 2017 that she would be stepping down the following year. Led by William F. Lee ’72, the senior fellow of the Harvard Corporation — the University’s highest governing body — the team of 15 searchers from the Corporation and the Harvard Board of Overseers began interviewing candidates and higher education experts across the country. In January, the search committee held a secret, all-day meeting at the home of Corporation member and searcher Tracy P. Palandjian ’93 in Belmont, Mass., where Crimson reporters identified at least three members of the committee. The meeting was one of at least 17 secretive meetings that the committee held during the search process. On Feb. 12, after months of silence, the committee announced that Bacow would succeed Faust. Bacow formerly served as the president of Tufts University and the chancellor of the Massachusetts Institute of Technology. Bacow — who has ties to Harvard Law School, Harvard Kennedy School, and Harvard Graduate School of Education — served on the search committee for months as a member of the Corporation before quietly stepping down to become a candidate. Bacow was hiding in plain sight: The Overseers’ eventual vote to confirm a leader from within the selection committee itself is without precedent in recent Harvard history. 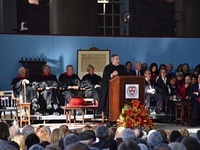 In his first remarks as president-elect, Bacow spoke about the need to address criticisms levied at higher education, and he later told The Crimson he was in “sponge mode” learning about his new job. Over the summer, Bacow met with the deans of Harvard’s 12 schools and legislators in Washington, including Senate Minority Leader Chuck E. Schumer ’71 (D-NY), U.S. Senator Mike D. Crapo (R-ID), and U.S. Senator Edward J. Markey (D-MA). The University’s new president also made a string of administrative appointments early in his tenure, appointing Claudine Gay Dean of the Faculty of Arts Sciences in July. Gay, who previously served as dean of social science became the first woman and first person of color to hold the position. 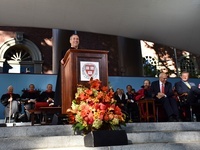 Bacow was officially sworn into office at an Oct. 6 inaugural ceremony attended by his four living presidential predecessors, Massachusetts Governor Charlie D. Baker ’79, and student demonstrators protesting Harvard’s sexual misconduct policies, among others. Considered to be the man for the moment with his decades of experience in higher education, Bacow takes charge at a time when Harvard finds itself subject to a slew of of lawsuits, a new endowment tax imposed by D.C. lawmakers, and criticism that the University only caters to America’s elite. During his first several months in office, Bacow hit the road as part of his goal to convince people across the country that the University can have a positive impact on their lives. So far, Bacow has visited his home state of Michigan as well as San Diego, Calif.